I am engaged in this job for about 41 years. About 9000 marriage successfully done by me. My interview was circuled many times in many TV channels like BTV and other Private television channel and also at different kinds of newspaper. My organization Ghotok Pakhi Vai Pvt. Ltd. is an old marriage service provider organization. My organization government approved and licensed organization. I am providing marriage service for all kind of people like Doctor, Engineer, BCS officer, Army officer, Navy and Air Force officer, Pharmacist, Chartered Accounted, Banker, Police Officer, Top ranked officer in different mobile companies and many more. I served for highly educated NRB person from America, Canada, London, Australia, Japan, Malaysia, china and different European countries citizen and also divorcee Man & Women also. Last Valentine's Day, one of Bangladesh's leading matchmaker Ghotok Pakhi Bhai shares his secret to long-lasting love. Ghotok Pakhi Bhai is a 60-year-old spiritual guru, has been happily married with two (02) wives for the past 40 years. Having arranged more than 10,000 marriages across the globe, he says friendship is the key to a long-lasting and happy marriage life. Al Jazeera's Nicolas Haque reports from Dhaka, the capital of Bangladesh. Are you a girl? Do you wish to make marry? 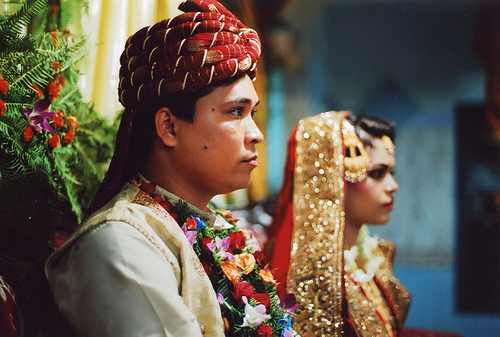 In Bangladesh dowry system still needed. Now a day many groom demand dowry for own. This is too old tradition in Bangladesh, India Nepal and nearby country's. groom demand motorbike, cycle, TV, radio, furniture, watch, land, house, car, clothes, kitchenware, job, air ticket, mortgage, education cost, trading support or cash etc. Sometimes a dowry agreement has to be fulfilled because that particular family's honour and social position are at stake. Dowry equals wealth, and it becomes a status symbol. For an uneducated girl a dowry payment can be up to Taka 20,000 but an educated girl often has to bring a much higher dowry to get the right bridegroom for her. The dowry system has been in place for centuries. It is essentially a contract between the father of the bride and the father of the groom before a marriage takes place. Marriage is a social contract between a man and a woman where they promise in the name of God to love and honour one another. By taking dowry one undermines the entire sanctity of the institution of marriage. Many poor people can not provide that support to the groom. That's why they go to for bank loans. Bank always ask for any mortgage and bank always issue the amount of money according the health of mortgage. Villagers go to micro credit bank for the loans. Poor and illiterate villagers suffer more than that educated people. Maximum villagers of Bangladesh are illiterate. They have no educational degree. Poor villagers have no huge and liquid credit on hands. They are not enough alert for their health and they do no do health insurance too. But, they go to bank for loans and also they go to insurance company for loan help. Many times we see some people helping to the poor father of bride by donating money, gift, food and many more. Many time grooms strongly claim for many and other promises gift to his father in law and the groom started torture to the bride. This is undoubtedly a disgraceful custom. Dissatisfied families inflict enormous pain and suffering on the bride. Sometimes such dissatisfaction motivates them to murder the bride. Sometimes the father of the bride does no go for justice by thinking family's honour and social position. Poor villagers have no enough money to go court. Now a day's justice becomes costly. Lawyer cost and many other costs are related with the justice. Ghotok Pakhi Bhai Pvt Ltd has been running successfully ever since independence. After his Old Dhaka office started to get too crowded he took an office at Eastern Plaza and has been operating from there for 16 years now. People come to Pakhi Bhai's marriage agency and ask for a bride and groom with certain qualities and qualifications. The agency then provides them with the CVs of people who have such qualities. A bride/groom (or their guardians) narrow down the choices and the agency calls the other party up for a possible first meeting. The parties who agree then meet each other in a 'viewing room' attached to Pakhi Bhai's office. After a satisfactory first meeting the talks and negotiations take off from there. Pakhi Vai engaged in this job for years. About 8000 marriage was done by him. His interview was circular many times in many TV channels like BTV. Different kinds of newspaper published his interview.